Renzo Piano has cut 54 storeys from his stalled Paddington Pole skyscraper to create a new proposal for a "floating" glass cube on the site by London's Paddington station. Piano's new 18-storey building, redubbed the Paddington Cube, comprises a 14-storey office block raised 12 metres above a large public space. The cube would be supported by slender poles over a five-storey podium containing shops and restaurants with subterranean access to a new Bakerloo line tube station. 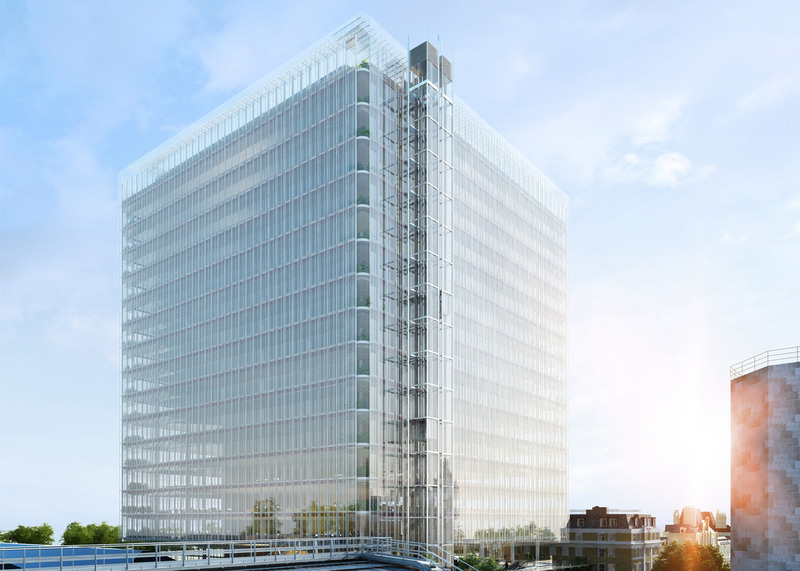 "When you exit the station you will see a clear floating cube levitating above the ground," said Renzo Piano and Joost Moolhuijzen of Renzo Piano Building Workshop about the new design. "We are obsessed with lightness and have given the building a sense of flying above the ground and defying the laws of gravity," they added. "The facade will be crystalline, like a fine lace of steel and glass in a clear pattern like the beautiful arches and skylights of Brunel's station." The original plans for a 254-metre skyscraper by the Italian architect behind London Bridge's The Shard skyscraper were withdrawn amid protests earlier this year. London architect Terry Farrell had attacked the £1 billion scheme as "piecemeal and opportunistic", while the Skyline Campaign petitioned against its impact on London's horizon. Skyline Campaign co-founder Barbara Weiss described the revised plans as a huge result for the group, but said more could be done to scale back the building's proportions and to contextualise it with its historic surroundings. "I'm absolutely thrilled that it's so much lower," she told Dezeen. "We never in our wildest dreams thought they would drop it to the extent that they've dropped it, so that is a huge result for the Skyline Campaign." But she added: "It's a very big bulky building. It doesn't float – they try to make you think it floats, it's actually still massive and in our in opinion much to big for the site." "It's not trying to be contextual," she said. "The materials are very alien to the area. It's pushing the envelope for monetary reasons rather than architectural reasons." Proposals for the scheme, which is backed by The Shard developer Irvine Sellar, will be on show at the Old Post Office on Praed Street until 19 July. London is in the middle of a skyscraper boom, with over 100 tall buildings completed over the past year and another 119 currently in the works. These include the 73-storey 1 Undershaft by Eric Parry Architects and the 62-storey 22 Bishopsgate by PLP Architecture.